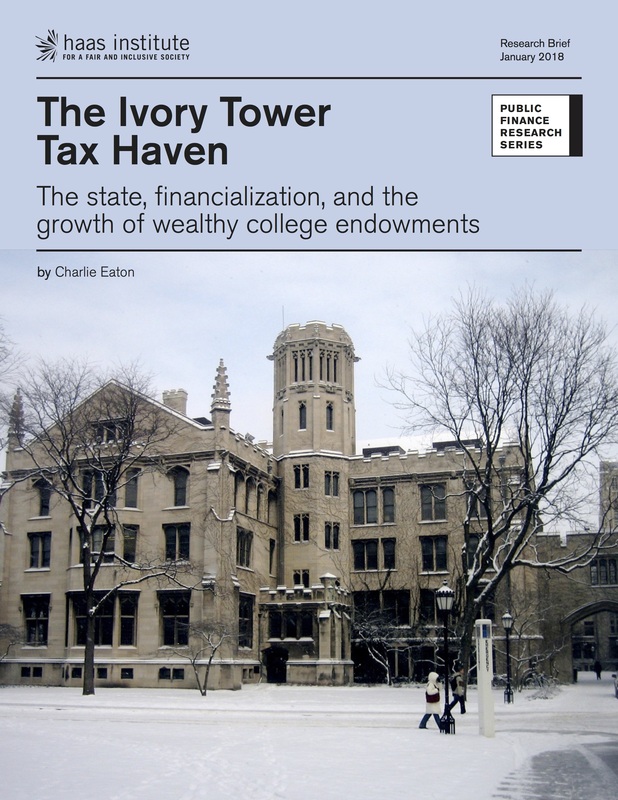 This paper argues that private colleges with substantial endowment wealth have increasingly become ivory tower tax havens. The author, Charlie Eaton, explains that these colleges have been supported by three large federal tax expenditures. The three tax expenditures involve tax deductible donations to endowments, untaxed endowment investment returns, and a complex new financial strategy known as indirect tax arbitrage in which private colleges use tax exempt municipal bond borrowing in place of endowment assets for capital projects. Eaton estimates that the three tax expenditures supporting endowments totaled an average of $20 billion per year as of 2012. This improves on previous estimates by including the $6 billion cost of indirect tax arbitrage. Eaton also uses new college-level data going back to 1976 to show that the federally subsidized growth of endowments contributed to new organizational inequalities in U.S. undergraduate enrolling institutions. For example, private institutions in the 99th percentile for endowment wealth per student increased their annual spending per student from endowments by 751% from $9,724 in 1977 to $92,736 in 2012. At the same time, these wealthiest schools have kept flat the overall number of undergraduates and the share of undergraduates from low-income households. “With private endowments doing so well, one has to ask if federal tax subsidies might be better used elsewhere,” said Eaton. “For example, we could nearly double the $28 billion in federal funding for Pell Grants by redirecting the $20 billion in federal tax expenditures on endowments. Click on the image to download the file or click here.